Pink and gray interiors inspiration. The combination of light gray with pastel pink works well to create a neutral space with a dash of charm. 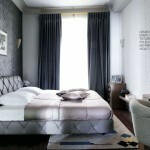 Pink and gray color schemes create interiors that are functional, yet with a touch of elegance and a drop of femininity. 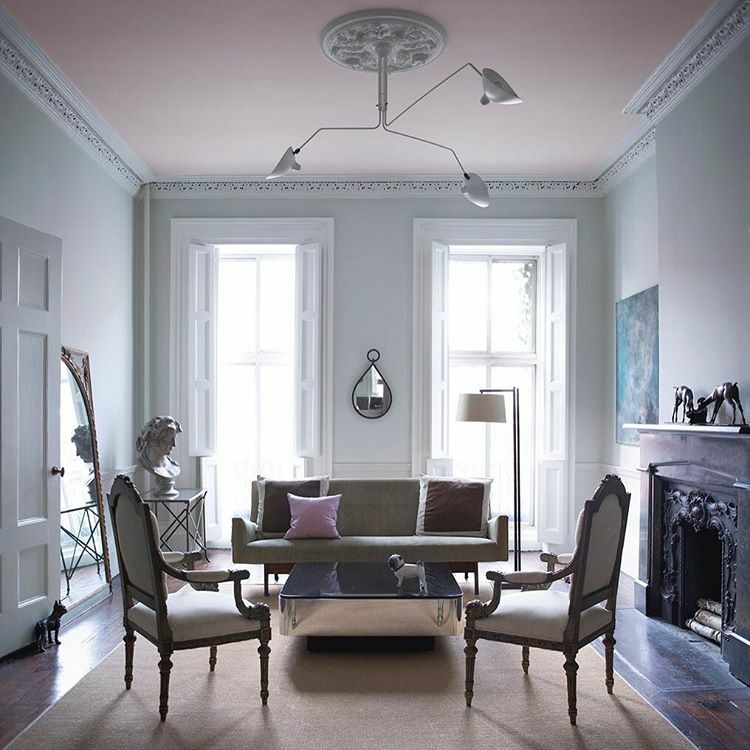 You can achieve a similar look to the pink and gray interior below by painting a pink ceiling in a color like Benjamin Moores Powder Pink 2009-70. This beautiful shade of light pink paint is used to soften the coldness in Benjamin Moore's Stonington Gray HC-170 walls to create a relaxing, charming living area. In this pastel pink and gray interior, sophistication is maintained with the predominant use of light gray and oatmeal tones throughout and only slight use of pink as seen in the ceiling, if the colors where reversed the interior decor would feel much more feminine and less sophisticated. 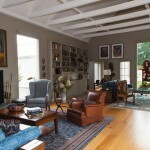 Adding a ceiling painted in a surprising color is a great way to add a twist to neutral color schemes. It gives warmth to an interior and creates an element of surprise and whimsy. This living space combines Traditional furniture in neutral shades with touches of modernity and contemporary elements. The irregularly shaped lighting and modern color scheme in pink and gray and the abstract blue and gray artwork bring in the modern elements to this space. The mirrored square coffee table, the oatmeal sofa with square brown and pastel pink pillows, the floor lamp and the tear shaped mirror in the far wall bring in the contemporary elements. The Traditional elements are seen in the decorative wall cornices, the decorative fireplace, two armchair sand decorative floor mirror. 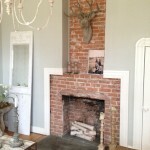 The combination of all these three elements creates a stunning eclectic interior. Neutral, pastel living room with light gray walls, light pink painted ceiling, sisal rug, neutral oatmeal sofas and armchairs, mirrored contemporary square coffee table, decorative fireplace, abstract art, ornate mirrors, brown and pastel pink throw pillows.